Saying thank you to a leadership donor – and doing it well – is not always easy. First, you have to say it in a way that is meaningful for the donor. Second, you have to do it in a way that doesn’t break the bank! Recently, I was visiting with a donor stewardship director at one of our country’s most distinctive universities. Together we were reviewing her first draft of a new comprehensive donor stewardship plan, paying close attention to her new plans for leadership donor stewardship activities. “I’m not sure I can sell all these strategies to my vp, because of cost – but the donor appreciation and long-term institutional benefit would be tremendous,” she stated, looking for counsel on how to prioritize. I suggested that she plot all of the leadership level donor stewardship strategies on the matrix and eliminate any that fell into the high cost-low impact cell, reduce those that landed into the low cost–low impact cell, and transform those in the high cost-high impact cell to fit in the low cost- high impact cell. 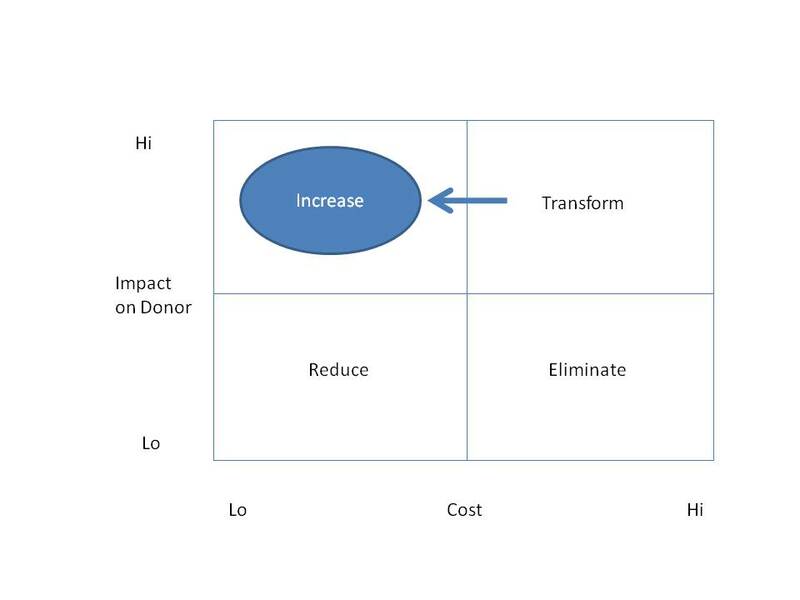 Moving initiatives from the high cost–high impact cell to the low cost-high impact cell encouraged her to question the wisdom of creating new donor stewardship events. We discussed an integrated approach in which every public activity of the institution could serve as a vehicle to recognize leadership-level donors. Pre-game at the football game? Publicly recognize a donor. The next theatre production? Publicly recognize a donor. An event at the art gallery? Publicly recognize a donor. We quickly identified over 30 events throughout the year that had great potential to serve in this stewardship capacity. Since these events were already planned, there was minimal increased cost. And since these events were part of the fabric of the University, she would be enhancing donor relationships in an authentic way. . .bringing donors closer to the essence of the University’s work. Development professionals are creative folk. When they are given a problem to tackle, such as enhancing donor stewardship, they tend to lean in the direction of new creations, new events, and new initiatives. However, if we structure our options (as above), we may find alternatives which can better meet donor and institutional goals as well as reduce costs. I love the model. Dr. Judge and Dr. Cunningham would be so proud!! The model does seem like it would be helpful to prioritize activities and could be applied to any new initiative or program that you were trying to develop and implement.